Copper can be worked into many attractive designs and is often used to create unique, sculpted designs. If you’re looking for a copper fountain you’ll want to consider the variety of copper fountain finishes that are offered for your indoor water wall fountain. From chemical aging to unique patterns and designs, this is where you will want to start the process of creating a copper indoor wall fountain that reflects your taste. 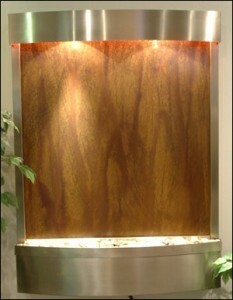 Copper can be combined with many other materials as either the frame or the front face of the fountain. Of course, you may choose to go with a full copper wall waterfall. You should know that, due to the widths of copper sheets, anything wider than 46” will have a seam. Because of this you may want to look at dual-panel copper wall fountains or even triple-panel copper wall fountains if you are looking for a large indoor wall fountain that boasts the look and distinction only copper can deliver.